A Massachusetts landlord told a Harvard University graduate student that he wanted her to move out of her apartment because her legally owned firearms made some of her roommates uncomfortable. 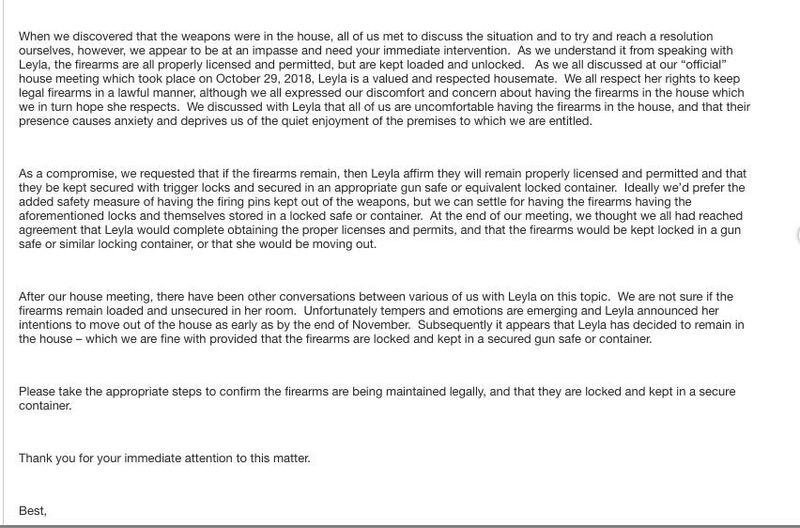 "Since it's clear that Leyla wants to keep her firearms, it would be best for all parties if she finds another place to live," Dave Lewis, president of Avid Management, said in an email to the household obtained by the Washington Free Beacon. The request that the student, Leyla Pirnie, move out came after her roommates searched her room while she was not home and found her firearms. That prompted one of the roommates to email Lewis requesting he verify that Pirnie was in compliance with applicable firearms laws. 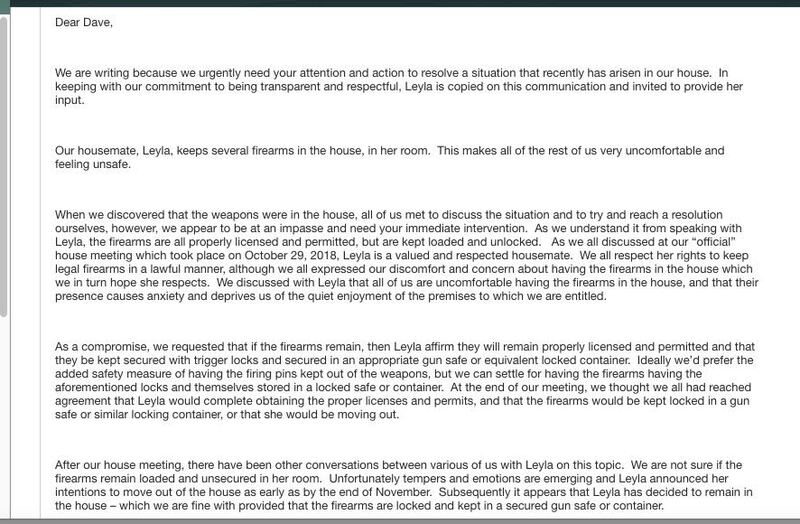 "We discussed with Leyla that all of us are uncomfortable with having firearms in the house, and that their presence causes anxiety and deprives us of the quiet enjoyment of the premise to which we are entitled," the roommate wrote to Lewis. Pirnie said she feels her roommates violated her privacy and now they and her landlord are trying to violate her rights. "A few weeks ago, I came back to my apartment from a weekend trip and was confronted by one of my roommates who asked if I had guns in the house," she told the Free Beacon. "After being told far too many lies to count, my roommates finally admitted that they searched my closet, under my bed, and all of my drawers in pursuit of finding my guns." 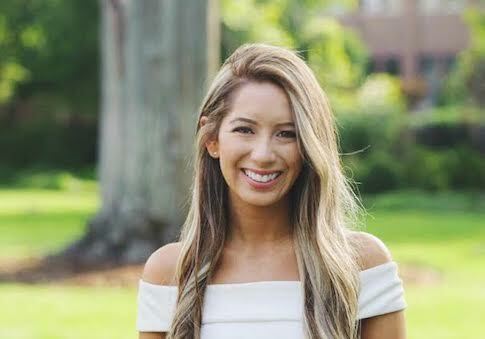 While she was given several different explanations for why the roommates entered and searched her room, the 24-year-old said she felt her political beliefs and where she is from played a significant role in the roommates' actions. "When I asked them why they were in my room to begin with, they each came up with completely contradicting stories (none of which made any sense), but one comment struck me in particular: ‘We saw that you had a MAGA hat and come on, you're from Alabama… so we just kind of assumed that you had something,'" she said. "I asked why they didn't just call me and ask me before intruding. One of the girls responded that fear took over her body and she felt compelled to search my room until she found proof… I cannot make this up." Pirnie said she had been living in the apartment since September without incident, and she kept her political beliefs to herself before the incident. But she did have a Make America Great Again hat in her room. 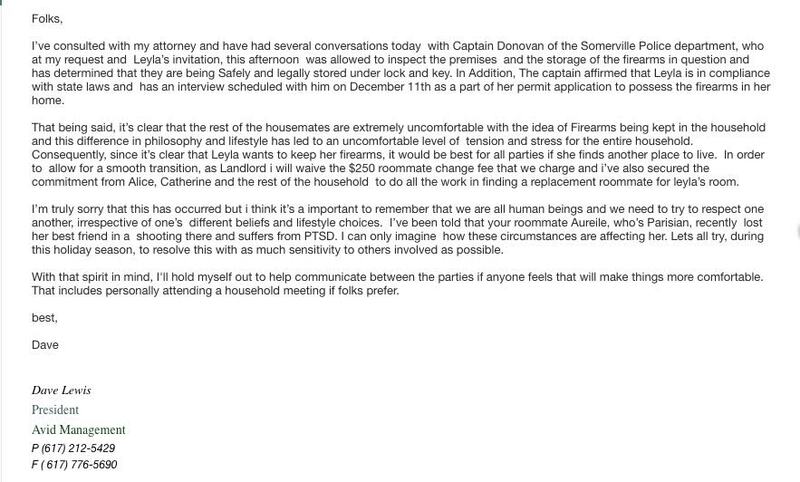 In response to the email from Pirnie's roommate, Lewis contacted Captain James Donovan of the Somerville Police Department to inspect Pirnie's firearms and ensure they were in compliance with Massachusetts law. Pirnie agreed to allowing the police to inspect her firearms and said she was told she is in compliance with all applicable laws. Lewis acknowledged the department's conclusion that Pirnie was not breaking any gun laws in his email telling Pirnie to move out. Captain Donovan told the Free Beacon he could not comment publicly on the matter. Dave Lewis and the roommate who emailed him did not respond to repeated requests for comment. Pirnie said the roommates confronted her about her firearms and she explained to them she was a legal gun owner who is trained in the safe handling of firearms. She said the roommates weren't concerned with Pirnie's handling of the guns but rather that somebody might break in and turn the guns on them or the guns "might go off on their own." She said her landlord's concern over some of her roommates being uncomfortable with legally owned firearms is misplaced and his request that she move out is inappropriate. "What I find uncomfortable is coming home to find out that six people I barely know went into my bedroom without permission and went through every single one of my drawers, without any regard to my privacy whatsoever," Pirnie said. "My landlord's e-mail, though carefully crafted, showed tremendous prejudice against my right to legally have firearms." Pirnie said her motivations for owning firearms have been ignored even though she shared them with her roommates. While an undergrad, she said she was in a physically abusive relationship. She said the experience is part of what drives her to be armed. "Nobody has bothered to question, ‘Well, why do you want to have protection? Could it be because you've experienced something where you need to protect yourself as you see fit?'" she said. "I have a real and legitimate reason as to why I want to protect myself." When Pirnie and her father rejected Lewis's request that she move out in the middle of studying for finals, Lewis responded by saying his request "was based strictly on practical and not idealogical (sic) terms." He then warned that if the other roommates moved out Pirnie would have to pay their rent. "If the other roommates were to move out, Leyla would need to find roommates to share the place or foot the entire $6000+ monthly rent herself," Lewis wrote in an email to Pirnie and her father. "Obviously it would be much easier for the others to stay and just fill one room (and I'm confident—were this to happen—that the remaining housemates will release Leyla from any further responsibility under the lease) and that's why I proposed what I did." Pirnie feels she's being punished for being a gun owner. "I'm still very much so being threatened out of my apartment," she said. "Either I leave and incur moving expenses or my roommates move and I incur their rent expenses… Doesn't seem right. "Not only is this a blatant violation of my privacy, but it's also a violation of my rights." This entry was posted in Issues and tagged Guns, Harvard. Bookmark the permalink. Stephen Gutowski is a staff writer for the Washington Free Beacon. He founded his own site as a junior in college and has been writing about news and politics since that time. He spent 4 years with the Media Research Center and was most recently with the Capitol City Project. His email address is Gutowski@FreeBeacon.com. His twitter handle is @StephenGutowski.